The LAPD’s survey, Gangland Killings 1900-1951, list just three gang-related murders for 1928, although newspapers at the time of August Palumbo’s shooting death of July 18 refer to him as the seventh such victim in a “bootlegger’s war” that had been going on for six weeks prior. The 1951 survey also notes that there was “no prosecution to date” in the Palumbo case. In fact, there were plenty of prosecutions, just no convictions. Police said Augie Palumbo was known to them as a bootlegger of the city’s north end. It’s since been asserted that he was a lieutenant of Albert Marco. If so, Marco was no longer in a position to help him in the summer of 1928. Having been found guilty in federal court for Volstead Act violations in November 1927 and out on bail while that case was appealed, Marco had neglected to turn himself in to U.S. Marshals after the appeal was denied in May 1928 and on June 28 was arrested for assault with a deadly weapon following an altercation at the Ship Café in Venice. His trial was reported in the papers alongside news of the death of Augie Palumbo, violently killed in his automobile while parked outside his residence, 2912 Hillcrest Dr., on July 18. At first authorities believed he had been beaten with a hammer. An autopsy determined the true cause of death: six lead slugs from a shotgun in his head. On July 21, authorities announced that an asserted gang war that had lasted six weeks and resulted in the deaths of 7 men, including Palumbo, had now subsided. The identity of the other six victims is unclear. 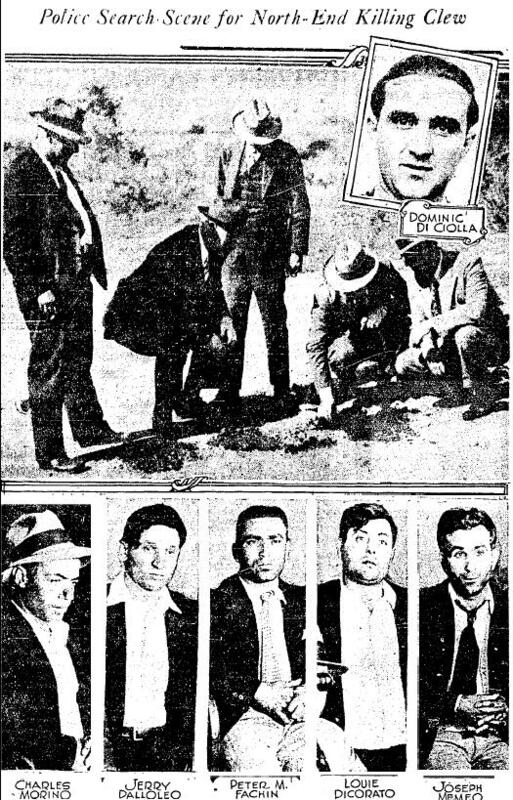 The LAPD survey makes no mention of several other gangland-style murders for that year, such as William Lafferty (alias George Rosen or Bill Rosen) whose bullet-ridden body was found on Western Avenue near San Pedro on January 28, 1928. Farmer Page, a onetime Marco affiliate, admitted having employed Rosen at one of his gambling clubs, was questioned in the case but not held. 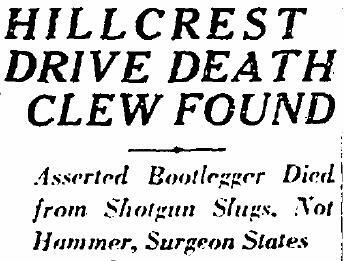 Also missing form the survey is William J. Cassity, killed July 8, 1928 in Altadena and believed to have been informing authorities about bootlegger activities. 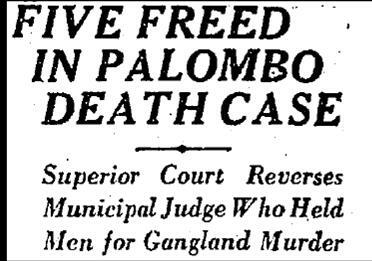 Police later asserted that Palumbo knew of this and threatened to “talk.” But they also told the press Palumbo’s death may have been the result of “bad blood” stemming from a feud that dated back to 1921 in Amsterdam, New York, where Palumbo had formerly lived (U.S. Census, 1920). 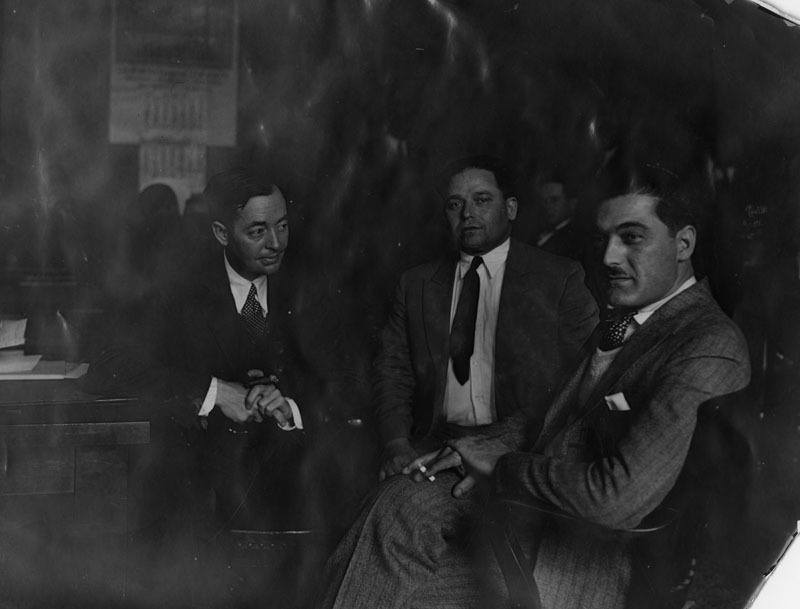 On July 24, 1928, two suspects were arrested in the case: Mike Pupillo of 2902 Palm Grove Ave., and Vito Ardito, co-owners of a café at 1156 S. Western Ave. in the Wilshire district. The following day they picked up six more suspects at a restaurant at 2622 E. 4th Street. Four more arrests were made on July 26. The arrests came about as the result of a combined police and sheriff’s investigation. For some weeks prior to the murder, police had been tailing a mysterious car that had arrived in Los Angeles from Chicago in May. On several occasions, they observed it parked in front of Pupillo’s house and the Western Avenue café. The auto was noteworthy for some interesting customizations, the likes of which had not been seen in Los Angeles before: it was equipped with bullet-proof glass and armored plating covering the gas tank and body. 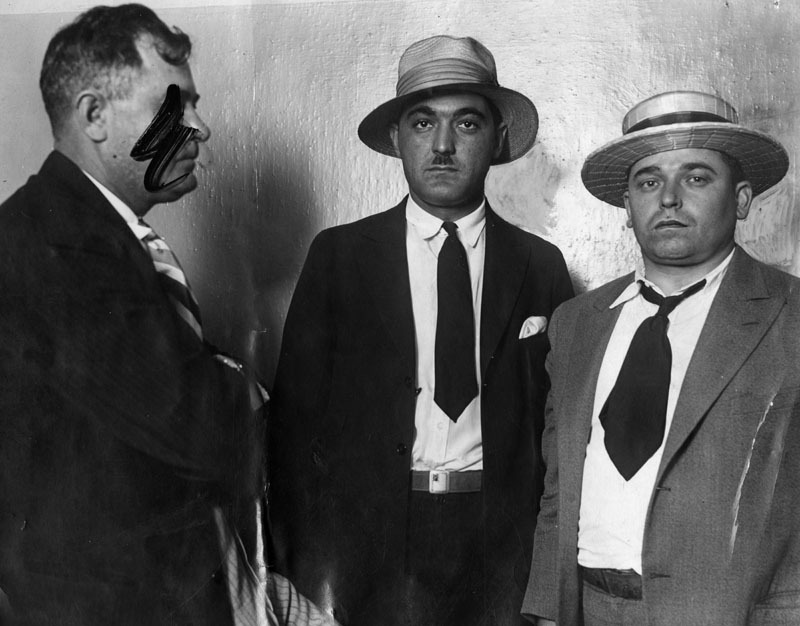 Captain of Detectives Bean believed the car, co-owned by Pupillo and Ardito, was one in which several Chicago gangsters had been “taken for a ride” and that Eastern gangsters were now attempting to “organize” liquor in L.A.
On July 27, five of the 12 men being held in the Palumbo case were arraigned: Dominick De Soto, (Dominic Di Ciolla), Rocco Gravino, Pupillo, Ardito, and Leonardo Gargano. A 6th suspect, John Testini, was not held for murder but rearrested on “vagrancy” charges. That appeared to be that. 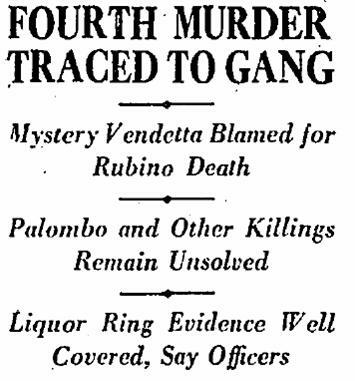 On August 25, Phillip Rubino was murdered outside his home at 6320 Holmes Avenue; he is the third victim listed by the LAPD as a gangland killing of 1928 though police at the time said they could find no connection between Rubino and bootlegging. Still, they believed he was killed by the same person responsible for the deaths of Cassity, Lafferty/Rosen and Palumbo. 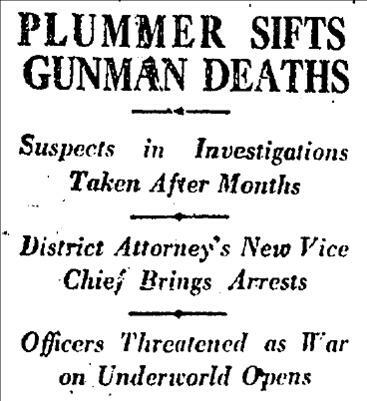 On March 1, 1929, former LAPD detective Clyde Plummer, who had retired from the police force to serve as head of the new District Attorney Buron Fitts’ prohibition enforcement and vice detail, announced the indictment of 5 men in connection with the murder of August Palumbo including Dominic Di Ciolla, Mike Pupillo, Vito Ardito, Gaetano “Guy” Digiuro, and Salvatore Verna. Ultimately only Di Ciolla, Pupillo and Ardito stood trial. The investigation leading the charges had begun months previously by the sheriff’s office, and included the death of Gravino as well. Plummer also hoped to link the men to William Cassidy’s murder, but this never came off. Attempts to have the case dismissed without it going to trial were thwarted. Pupillo faced additional charges for carrying a concealed weapon and was found guilty of those on April 19. Witnesses in the case reported having received death threats and were guarded to prevent intimidation or worse. When the trial began April 29, 1929, guards were also stationed in the courtroom. On May 2, police detective Frank “Lefty” James testified that he had been offered a $1500 bribe to “forget” certain evidence in the case- distinctive shotgun shells found at Di Ciolla’s home. 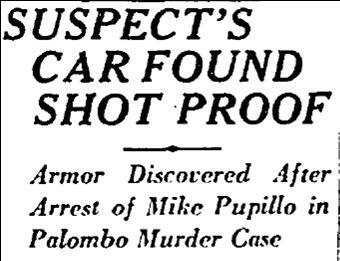 The armored car driven by Pupillo and Artito in 1928 was introduced as evidence, as was a gun found in a city dump back on July 18 1928, the night of the murder. 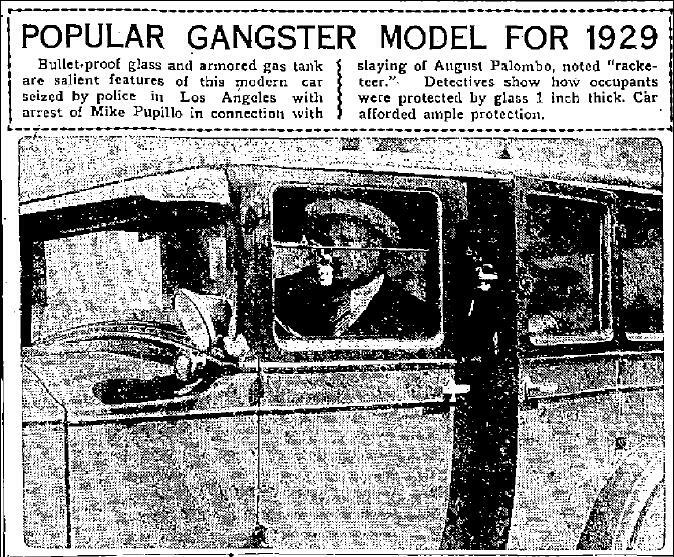 “Popular Gangster Model for 1929.” Syndicated press photo of Mike Pupillo and Vito Ardito’s armored car, introduced as evidence in the Augie Palumbo murder trial 1929. 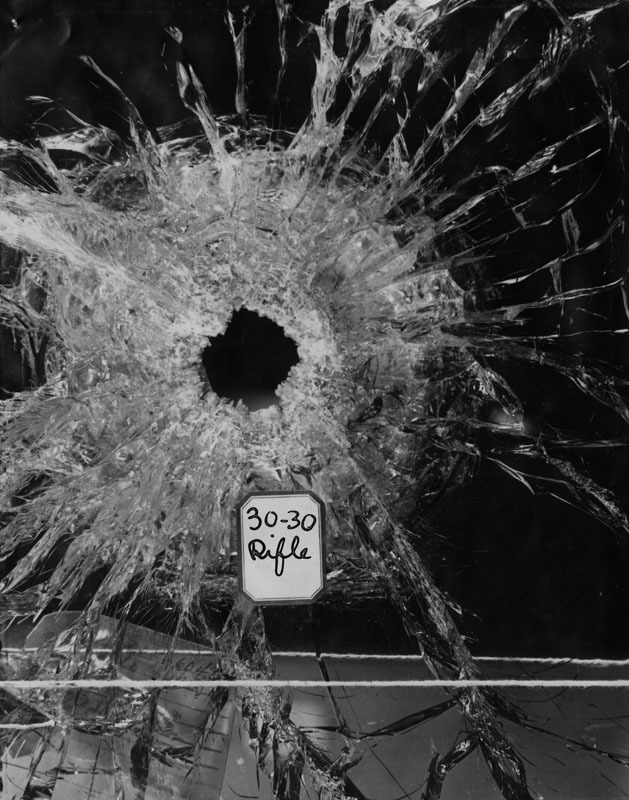 Bulletproof glass from Mike Pupillo and Vito Ardito’s armored car, tested at the Augie Palumbo murder trial, 7-27-1927. LAPL. Pupillo and Ardito testified that they were at their restaurant the night of the murder. The defense produced witnesses who backed up their story. Di Ciolla said that he was at home hosting a party at the time. On May 15, having deliberated for 40 hours, the jury voted to acquit the trio. They walked free. In September, Pupillo’s prior gun conviction was reversed. 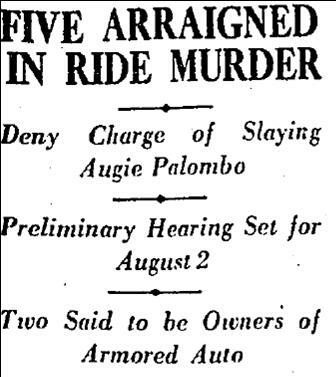 Though the LAPD survey erroneous records “no prosecution” in the Augie Palumbo murder, the name Dominic Di Ciolla does appear in it- as a victim for the year 1931. His bullet-ridden body was found on the morning of March 19 on a remote stretch of Arleta St. near the town of Van Nuys. Police suspected that Di Ciolla had sought to become “boss” of L.A.’s “Little Italy.” Five men were arrested within hours, questioned, and ultimately released on a writ of habeas corpus filed by their attorney, Sam Rummel. Guy Digiuro, who had once been a suspect in the Palumbo murder along with Di Ciolla, was arrested on March 31. He had an alibi for that night: he’d been playing cards at a restaurant at 223 Sunset Boulevard. Salvatore Verna, who had also been charged in the Palombo case, was arrested by Lefty James on April 6; he too denied any knowledge in the Di Ciolla slaying. There was additional arrests but in the end, no prosecutions in the case, which went down in the books as unsolved. 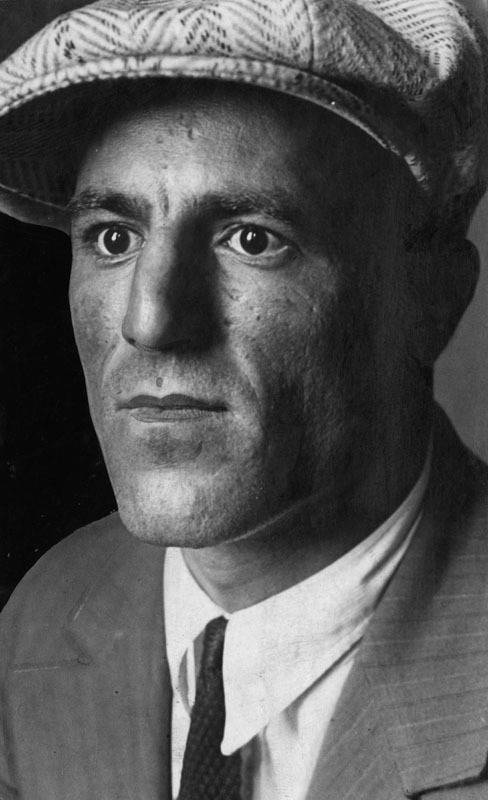 On March 21, 1931 the body of a man was found shot to death in a ditch near Downey; he was soon identified as Vinciano “Little Jimmy” Basile. Police learned that Basile had been shot while riding in a car with Giuseppe Ernesto “Joe” Ardizzone, boss of the Los Angeles crime family. Ardizzone had been shot several times in the back but managed to get help and was taken to Hollywood Hospital where he recovered. 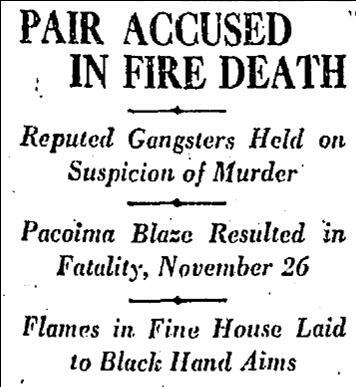 Initially, police theorized that Basile and Ardizzone were “members of a gang at odds with that of Di Ciolla before his death” (LA Times 3-23-1931). 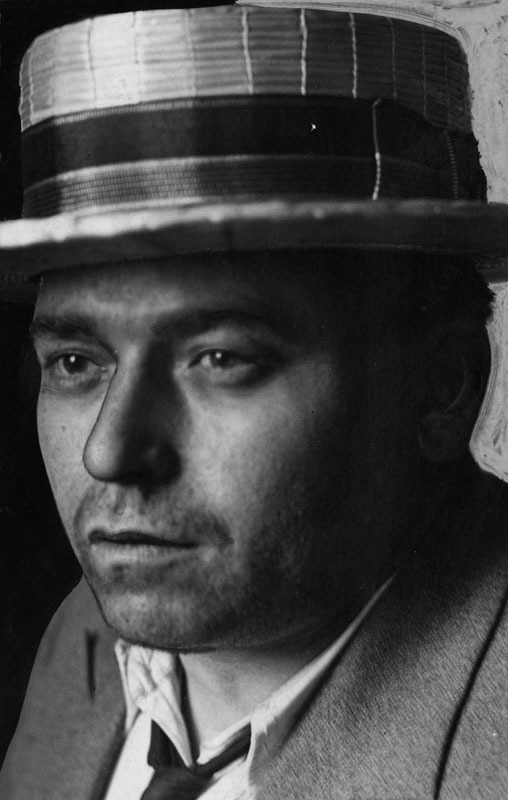 According to LAPD’s record, however, Basile was a partner of Di Ciolla’s in the bootlegging business and Ardizzone had threatened to “get” the pair after they refused his attempt to muscle in on their operation. Police believed friends of Di Ciolla and Basile had opened fire on Ardizzone, but were unsure as to whether Ardizzone had already killed Basile or if Basile had been caught in the crossfire. Neither Ardizzone nor anyone else was ever prosecuted in the case. The first victim of 1928 is listed in the LAPD’s survey, which was included as an appendix to the Governor’s Crime Commission final report of 1953, is “Frank De Falco,” shot to death 2-12-1928 in front of his residence, 814 Catalina St., San Pedro. A witness heard gunshots and saw a car speeding away from the scene. The report calls the victim a known bootlegger and the murder a suspected “Black Hand rub-out.” The LA Times makes no mention of it. The Long Beach Press-Telegram, however, reported the death of Angelo Joseph Caso, bootlegger, shot to death under identical circumstances on the same date, and on Catalina St. (George Eres “Does the Black Hand Extend to Southern California?” Long Beach Independent Press-Telegram, 5-3-1959). California death records confirm that an Angelo George Caso died 2-11-1928. There is no record of a Frank De Falco. 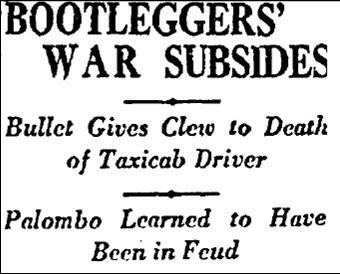 Likewise unreported is Bozo Loncar, “noted bootlegger” and proprietor of a “soft-drink parlor” at 650 ½ N. Broadway shot to death on 7-16-1928; or that of taxi driver Jack H. Palmer (alias Leon Henry Palmer, John Henry Curtiss), shot in the lonely hills above San Pedro 7-17-1928. 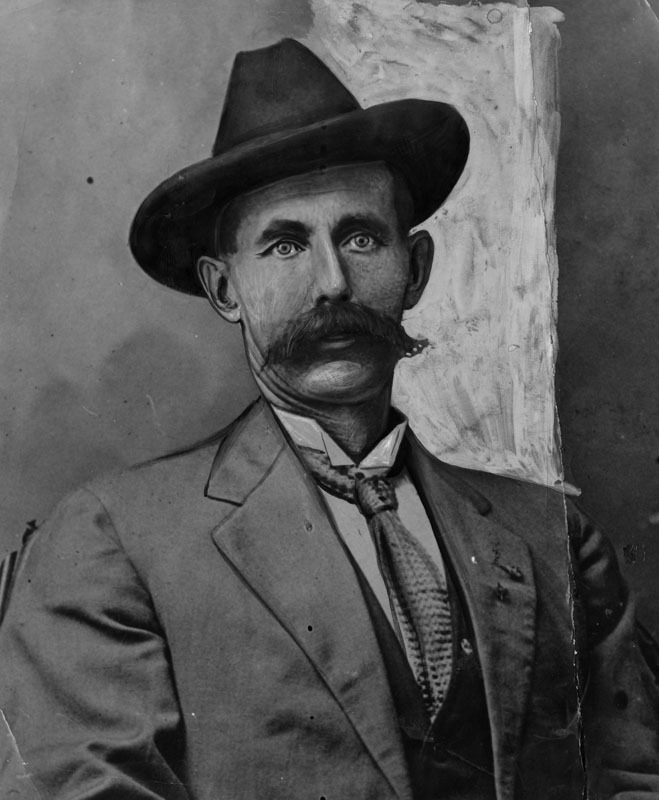 Phillip Rubino had been charged with violation of the Wright Act, California’s state version of the national Volstead Act, back in 1924 but the case was dismissed when Rubino’s lawyer argued successfully that authorities had searched his home with an improper search warrant. No one was ever charged in his murder. The LAPD’s survey for some reason records Basile’s death having occurred in “February” and Di Ciolla’s on 3-31-1931. On October 15, Ardizzone vanished and was never seen again. The LAPD survey would list him as a victim for 1931. 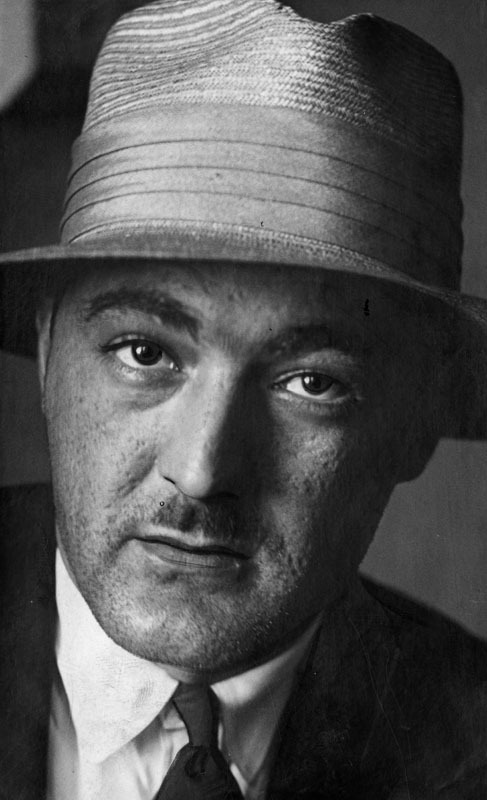 Jack Dragna assumed his role as boss of Little Italy. The other victims listed for 1931 are Paul Crank and Marvin Hart. 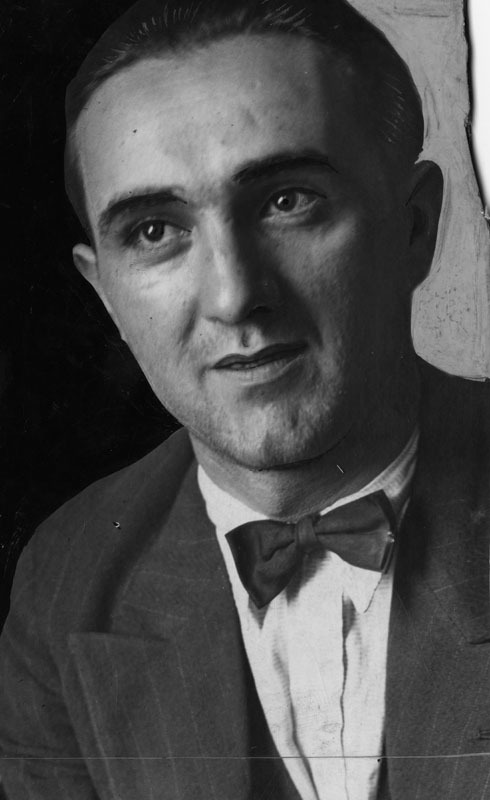 Attorney Sam Rummel was himself a murder victim in 1950.